“Machete” first existed as the trailer that opened up 2007′s “Grindhouse.” It was a satirical, B-movie idea so perfect for a trailer, and even more promising for a full length feature. This can be seen pretty much as a passion project for Rodriguez. It combines everything he’s loved throughout his career: westerns, Mexicans, samurais, and Danny Trejo. 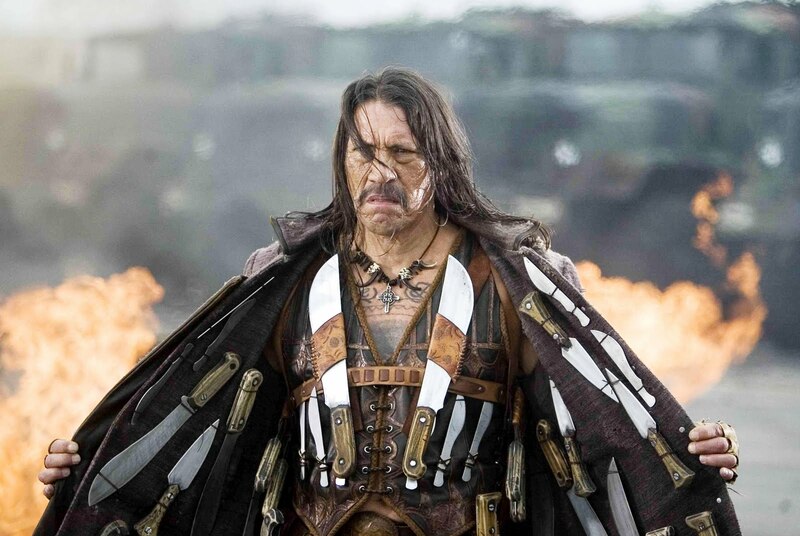 The titular Machete, played by Trejo, was once Mexico’s hardest yet most honest federal agent. After losing his wife to drug lord Torrez (Steven Seagal), Machete flees to America and works as a day laborer. One day, Machete is chosen by a mysterious man named Booth (Jeff Fahey) to kill the xenophobic Texas state Senator McLaughlin, who’s attempting to launch a campaign to keep all Mexicans out of America. After a setup and a few more unfortunate events, Machete joins forces with an underground network and a cop (Jessica Alba) for a very bloody culture war. “Machete” is one of those movies that’s made for the kind of people who like to do nothing but watch movies. Look closely and you’ll spot the occasional Mexican standoff, or blood spurting out only like it would’ve in “Shogun Assassin.” The score defies genre, as it switches between horror and action at times. Mostly though, “Machete” is Rodriguez’s second movie that embodies the grindhouse feeling. The grainy, cut up frames add a strange authentic value to every shot of the film. “Machete” is grindhouse in both look and feeling. It is constantly over-the-top and ridiculous on purpose. “Machete” is also the kind of movie that truly revels in shock value. Pretty much anything is turned into a weapon in this movie. That doesn’t exclude someone’s intestines. I won’t say more than that though. Good shock value should stay shocking through surprise. I think Rodriguez should continue making films that aim low. Why? Because that’s the kind of filmmaker he is. He famously made his feature debut, “El Mariachi” with just $7,000. He has a unique talent of making trashy seem classy. While he is certainly one of those filmmakers who draws so heavily on his influences, his substance still can’t match his style. The storyline of “Machete” lacked some of the fluidity of those of his best features, including “Planet Terror” and “Sin City.” “Machete” has three different bad guys, yet it is continually confusing who is truly the worst and who is really in charge. Rodriguez may be paying tribute to shoddy storytelling, but some of the plot holes here simply can’t be excused by that notion. Something I wasn’t expecting from “Machete” was how heavy of a satire it was going to be. It likely wasn’t meant to be that way when the story was first thought up but once the immigration debate reignited, I guess it was impossible to ignore. The satire is relevant and most effective when it isn’t so overt. The political ads randomly placed throughout the film might be off pace, but they’re certainly hilarious. Though I wish the movie could’ve balanced trashiness with smart satire about race and social issues like last year’s “Black Dynamite” did. Both films were tributes to exploitation films of the past. I will try not to spend too much time criticizing. After all, “Machete” does contain the first instance of Robert De Niro actually acting in years. Trejo is also about as entertaining an action star as Sylvester Stallone and Bruce Willis in their prime. At 66-years-old, some of the stunts he can pull off were truly impressive. Also, when “Machete” isn’t trying so hard to have an actual plot, it has moments of genuine entertainment and hilarity. I just think it should’ve put less time into being relevant and more time into being a B-movie. If anyone is to see “Machete,” it must be said that it is definitely one worth seeing in theaters with the biggest audience possible. Like the true grindhouse experience, “Machete” is more entertaining when seeing how the audience feels and reacts to everything going on on the screen. 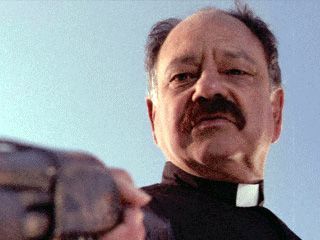 If everyone laughs at Cheech Marin as a gun wielding priest or Machete texting someone “You’ve just f**ked with the wrong Mexican,” than you’ll know you’ve picked the right showing. This entry was posted in Danny Trejo, Grindhouse, Jessica Alba, Machete, Mexploitation, Movie Review, Robert De Niro, Robert Rodriguez, Satire, Steven Seagal on September 3, 2010 by ian0592.